On Friday 13 July, the Cuba Solidarity Campaign joined with other Latin America solidarity organisations, communities and migrants groups to form a Latin America bloc on the Together Against Trump demonstration which saw more than 250,000 march in London. 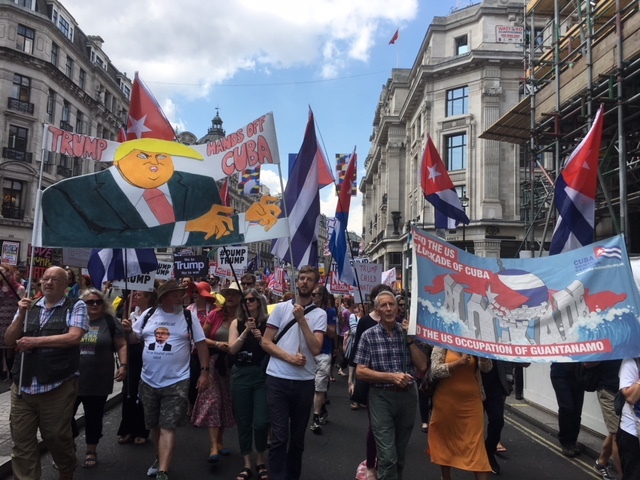 CSC staff, volunteers and supporters carried Cuban flags, banners calling for the end of the blockade and a ‘Trump Hands off Cuba’ banner, specially made for the event, while handing out leaflets about Trumps aggressive ‘regime change’ policies in Cuba and Latin America. The bloc, accompanied with a sound system playing regional music including Cuban classics ‘Guantánamera’ and ‘Comandante Ché Guevara’ was one of the most vibrant on the national demonstration against Trump’s visit. A few days earlier on Monday 9 July, CSC jointly organised a Latin America against Trump rally in London to build for the march. She highlighted women’s rights in Cuba and criticised President Trump “for attacking women’s reproductive rights” in the US and overseas. Arturo Rodriguez, general secretary of Cuban Industrial Workers’ trade union said "We never expect anything from the government of the United States." He reminded the audience that US intervention in Cuba and Latin America was a long history. “The US attempted to kill Fidel over 600 times - but he lived until he was 90 years old!” he joked. "Over 70 per cent of the Cuban population were born after the triumph of the Revolution and have lived under US blockade all their lives since. “The blockade is still there, and Trump has made stronger”, the general secretary said. “We've always had a lot of faith in victory- we will continue to construct our socialism. No force on earth can crush the power of truth and ideas”, he said. Lupita Valdés from Justice Mexico Now gave an update on the huge human rights abuses and tens of thousands of people who have disappeared in the last decade in Mexico. But there is now optimism for change in Mexico, she said, and congratulated ‘AMLO’ - Andrés Manuel López Obrador - on his recent emphatic presidential victory. Rocio Maniero, Venezuelan ambassador noted how "Trump has tightened the US blockade of Cuba and introduced sanctions on Venezuela and Nicaragua." “But the Latin Americans know first-hand about the danger of Trump. He’s threatened invasion of Venezuela. He’s called Latin American migrants animals. We need to respond to say that we don’t want this hate in our politics. We need to show him that he is not welcome here,” she added. “The United Kingdom doesn't welcome despots like Trump. We need to give him a visit to remember, in all the wrong ways!” the Labour MP said.